Tis the season to be extra busy and there is no exception in the Balch house. On top of shopping for Christmas presents and holiday parties. 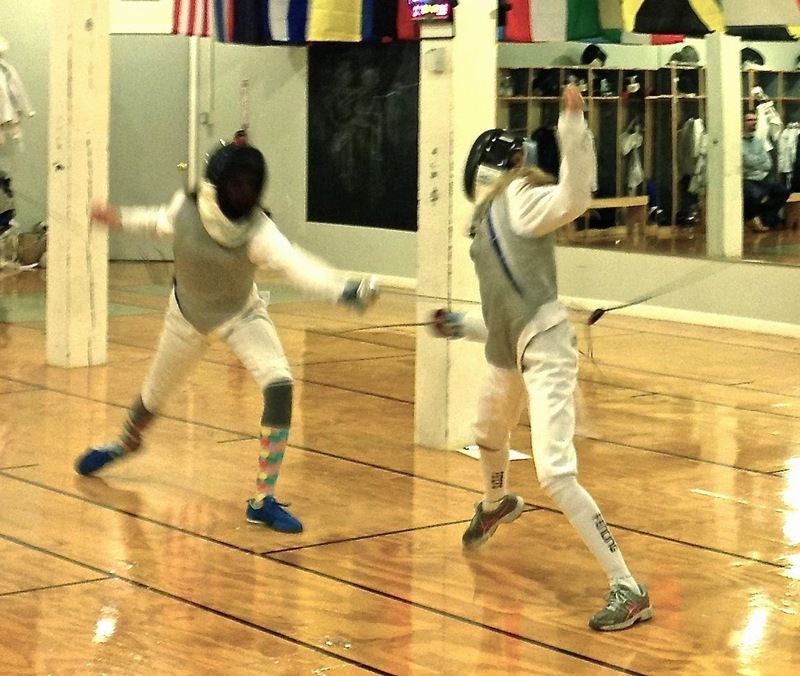 My son is working toward a Boy Scouts merit badge in rock climbing and my daughter just won her first foil competition. Plus she is participating in a softball clinic. 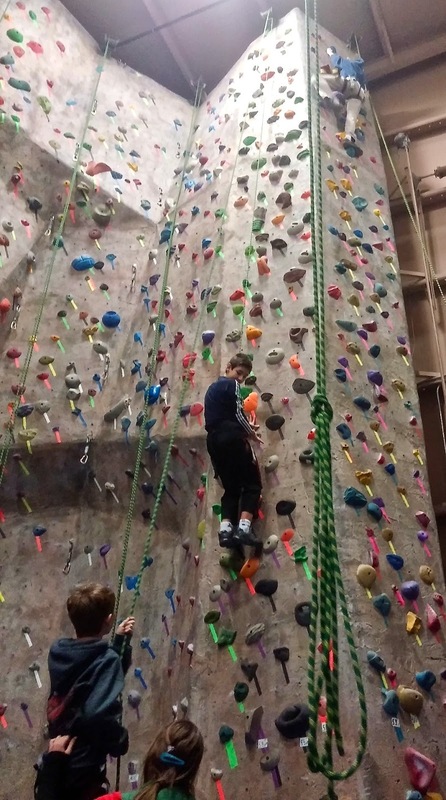 My son is the boy at the top of the wall. So when I looked at this recipe... first I knew I would have to substitute beef for lamb, because I would have needed to pre-order the lamb from the butcher's shop, and that wasn't going to happen! My daughter is to the left. The girl with the crazy socks. Reading through the ingredients the flavors appeared to be strong enough that they didn't need fussy attention. 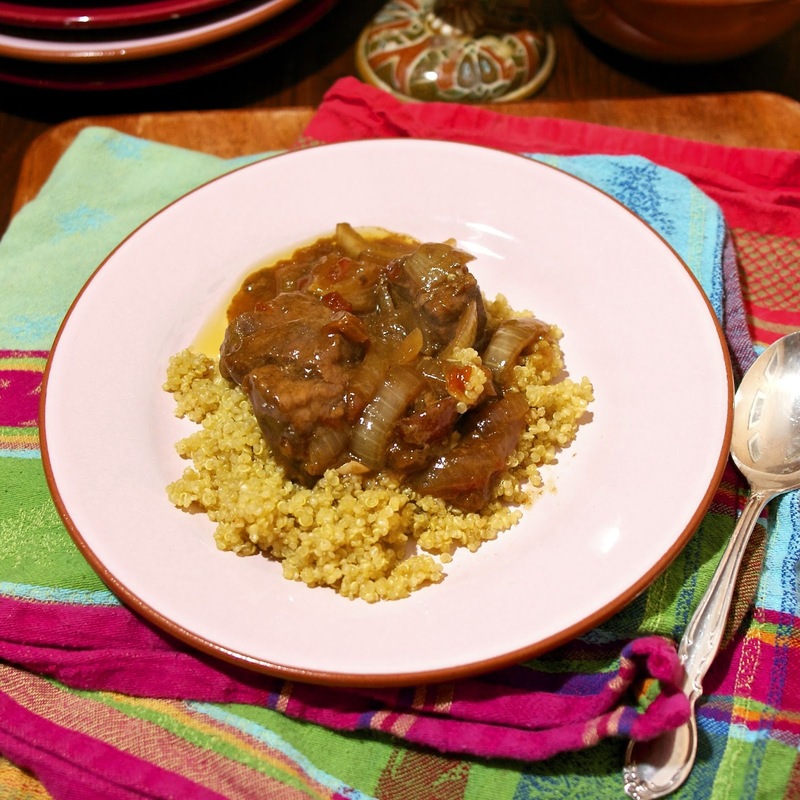 This recipe was ripe for slow cooker adaptation. I just layered the onions, chile pepper, apricots and beef in the crockpot. Whisked the rest of the ingredients together. Poured the sauce over the meat and 8 hours later we had an exotic flavorful meal. The juxtaposition of the sweet apricots to the spicy chile pepper balanced by the coriander and other Near East seasonings made for an exceptionally delightful meal. I served it over quinoa instead of couscous to accommodate my wheat allergy.. really a terrific meal for a rainy winter day. 2.5 pounds of round stew meat beef pre-cut. 1) Put apricots in a measuring cup. Cover them with water and microwave on high for 1 minute. Let them sit and plum while you prep the rest of the recipe. 2) Chop onions put on bottom of crockpot. Put chile pepper on top of onions. 3) Whisk together all of ingredients for the sauce except the tomatoes. Once you have whisked everything else together gently mix the tomatoes into the sauce. 4) Drain the apricots of water and layer them on top of the chile pepper. Top the apricots with the beef. 5) Pour the sauce over the beef make sure all of the beef is submerged or covered with tomatoes. 6) Cook on low for 6 to 8 hours or on high for 4 to 6 hours. 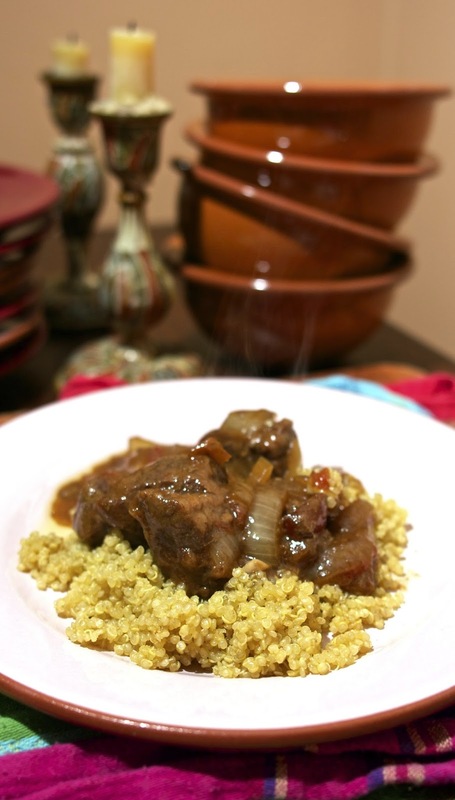 7) When stew is cooked remove chile before serving over: couscous, quinoa, rice or potatoes. Looks great, Diane, and I love your daughter's socks! Such a busy time with the holidays as well, but it looks like it's good things! They are her lucky little miss miss match socks. I suprised they let her wear them in tournaments. Good thinking on altering it for the crock pot! Fencing and rock climbing? I think your kids are super cool. I only did swimming and dancing school when I was younger. Their activities sound like much more fun! My kids are so lucky to be located in an area that has so many interesting activity options. You did more than me. I hung out in the school yard. I know I will miss these days too.. but right now I'm just tired of the driving. One of these days I'll find room in my kitchen for a slow cooker. I so want one. I don't have room for it. Everytime I use it which is often I luge it up from the basement. It's worth it! Whether it's a tagine, dutch oven or slow cooker, I think it all ends up tasting the same and using a slow cooker certainly is a simpler process, I think. I finally purchased a small crockpot so my winter meals tend to be pre-planned and dinner-ready. And, I don't even have busy teenagers to care for. Your kids certainly are talented and participate in interesting activities, making for a fun family. One of my good friend's husband is just starting to build a kayak. He is starting with a kit and working at the Anderson Ranch (woodworking department) this winter. He is so excited. I told him about your husband. The next time I see him, I will send him a picture of your masterpiece..
Building a boat is such a great winter project. He is going to be so satisfied when he finishes it. You are a busy enough person to invest in a slow cooker. I really love it because you can prep when you have time to prep and if dinner time is your busy time you don't have to worry. I love the idea of making this in the slow cooker. Thanks for the instructions. The sauce was the best part, and it seems that it goes well with any kind of meat. So many possibilities for the next time!!! I hope you are enjoying the busy holiday season. We are enjoying it thanks so much. Yep, the slow cookre made this a little easier to fit into the craziness of life. The crazy socks comes out my daughter never being able to match two socks. When we discovered little miss mismatch socks she was thrilled by the idea of never having to match them again. I'm not surprised that it would take more than an hour, especially with lamb. Yes, we are having fun, hope you are having a good season too. I just love slow cooker meals…perfect for a busy season and busy life! Love your daughters style!! I plan on making this tomorrow for dinner…just could not get it done this week! I did make the Red Kuri soup…and loved it! Nice post, Diane! I enjoy my daughter's fashion sense. Other than flashy socks she really has a subdued taste. Enjoy this stew it is delicious. I am definitely using my slow cooker next time!!! Whatever I can adapt to the slow cooker I do, it makes life so much easier. Glad this worked well with beef and the slow cooker. Sounds like life is busy for you. This was a welcome meal in our house and would make it again. Thanks for stopping by. I hope you get to try this one Joy the seasoning is terrific. 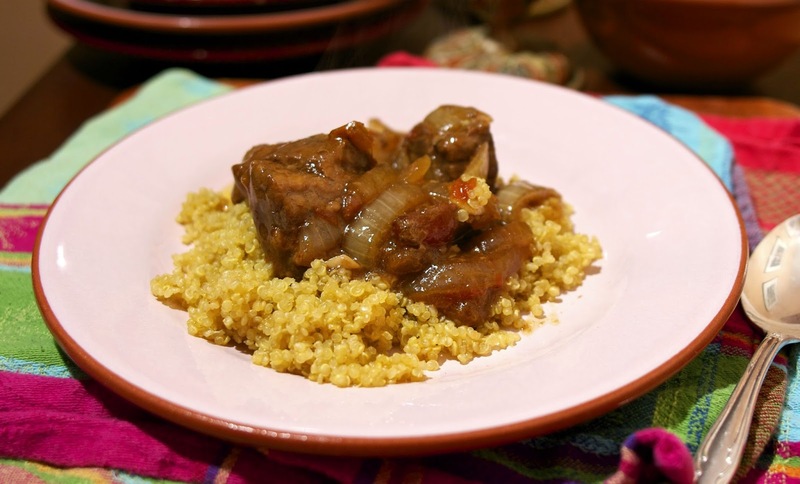 I love how you've been able to adapt so many recipes for the slow cooker. This one sounds wonderful and so flavorful. It is super flavorful. I have been really happy at the results of a lot of slow cooker recipes too. Really helps when you are busy.